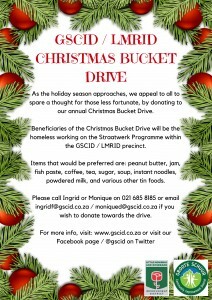 Help bring some Christmas cheer to those less fortunate by participating in the GSCID’s annual Christmas Bucket Drive which launches today. 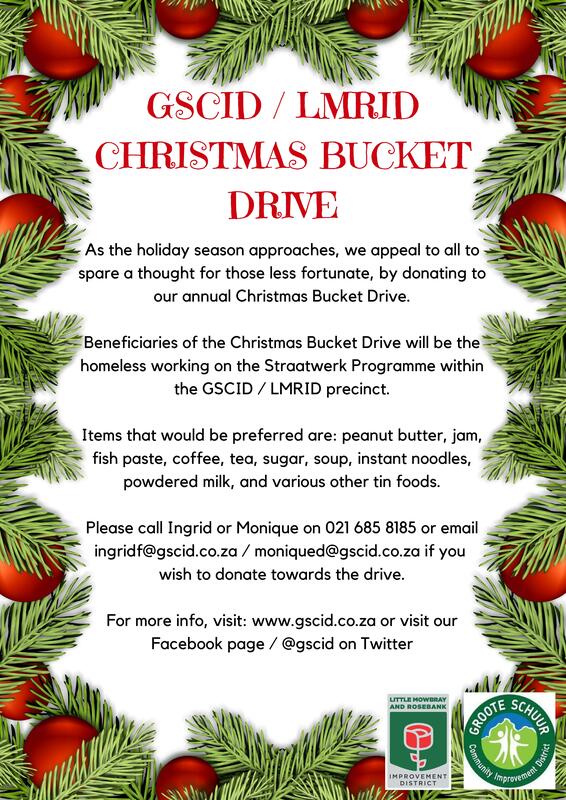 The bucket drive forms part of the GSCID’s social outreach programme and is aimed at improving the lives of the homeless within the precinct. The buckets will be distributed to those most in need participating in the Straatwerk programme at the annual homeless Christmas party. “We are very grateful to those corporates and individuals who have supported this initiative in the past and we hope this year will bring similar support,” says GSCID General Manager, Nina Farrell. Items that would be preferred are non-perishable goods such as tinned or bottled foods (peanut butter, jam, fish paste, coffee, tea, sugar, soup, instant noodles, powdered milk, to name just a few), which will be packed by the GSCID team in time for Christmas. Donations may be dropped off at the GSCID offices at 93 Main Road, Mowbray or will be collected from donors. Please call Ingrid or Monique on 021 685 8185 or email ingridf@gscid.co.za / moniqued@gscid.co.za if you wish to donate towards the drive.